Seemed to me the Rams offense struggled more than the Patriots offense. I mean 27 of the the Rams 60 plays went for 0 or negative yards (45%). Wait, Shanny put up 28 points and McVay put up 3 against Belichick. Maybe Shanny has a lesson, and McVay has lessons to learn. Could be McKinnon was hired to head the repertoire expansion process within the rushing department. I like trying to circumvent third down by converting on first or second down. I’d rather bypass the red zone by scoring from far away. I find it hard to believe that Shanny totally ignores situational football, but I’m not at practices. Perhaps it does need more emphasis. He already has an experienced offensive mind on his staff. I call him Big Shanny. Shanny put up 21 points, not 28. I stand corrected, but 21 is still better than 3…seven times better. Indeed. Shanny had better talent, and the Patriots defense he faced had inferior corners. Was that why they won 3 more games and had 2 more pro bowlers? I told you Gilmore was my mvp after Brady before the game, but you were adamant it was Mr. Brown. In all seriousness, Grant. What do you make of the Miles Austin hiring? But are you disagreeing? I love Gilmore. Brown simply was more valuable because the Patriots were desperate for a left tackle after losing Solder and Wynn. Seems like the 49ers are hiring assistant coaches who can teach technique, not just scheme. Am I disagreeing? A little, afterall McVay had a Dream Team. Three #1 picks on offense with Goff, Gurley and Cooks off the top of my head, so both offenses had their version of The Triplets…. Gurley fell apart down the stretch and was ineffective in the Super Bowl. The 2017 Super-Bowl versions of Ryan, Jones, Sanu, Gabriel, Hooper, Freeman and Coleman formed a much better group than the 2019 Super-Bowl versions of Goff, Cooks, Woods, Reynolds, Higbee, Gurley and Anderson. Could be but the Falcons offense ranked 10th in points, 6th in yards, 4th in passing yards and 27th in rushing yards. The Rams offensive ranks were, 2nd/2nd/5th/3rd. I see, and how would you explain the 2018 Patriots defense ranking 7th, while their 2016 team ranked 1st? Weaker regular-season schedule in 2016. Plus, the 2018 defense had a new defensive coordinator and new players to integrate. Everything clicked for them in the playoffs. Gilmore and J. McCourty are far superior to Malcolm Butler and Logan Ryan. A convergence! That settles it then. Thank you for the lesson, Grant! In my Detective Columbo voice together with voice inflections and pacing; Oh, listen, one more thing, Mr. Cohn. How does an act of desperation at LT become more valuable than a lock down corner in a game of defensive dominance? What would Joe Friday (Jack Webb) say? “Hold it right there, Razor. Football expert, you’re under arrest”. If Brandon cooks would have caught the pass for td,or even pass interference than we’ll be talking about how bad Brady was. Only outcome of this game was mcvay was to conservative. I don’t agree with this. 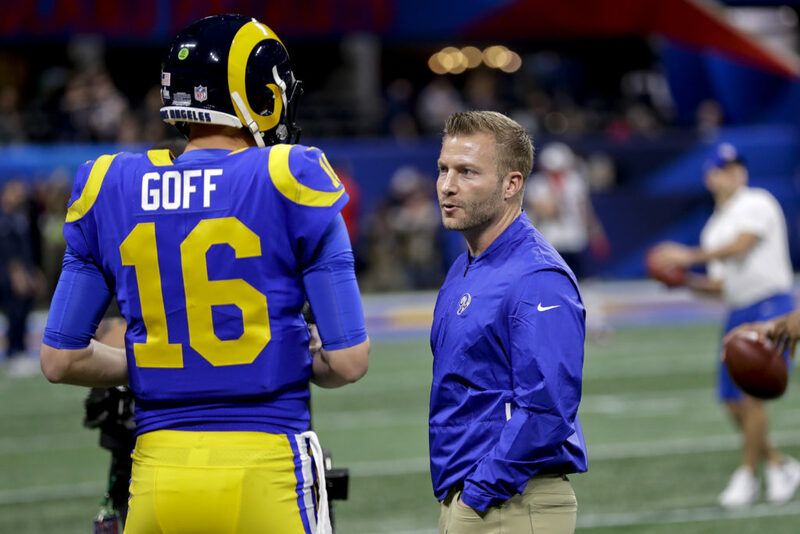 Sure, some talk was made about their potential longevity with McVay and Goff, but the narrative around the Rams was very much “this is their window” and that soon after they will be on the decline. And I doubt anyone anticipates anything like what the Pats have done, dynasty wise. It’s the best dynasty ever, for a reason. Yes, there WAS some buzz going around about the Rams not being able to sustain their edge very long (season-to-season), given how they assembled their ’18 roster. Expanding the scope a touch…. What can the 9ers learn from the mighty Chiefs and their checkered performance against the Pats? Don’t play Belichick and Brady in the playoffs? We’re closing in on the combine (2/26). Wonder how Grant would perform in the cone drill…. If you can get a flight out to Indy, you can stay with my son at IUPUI. Thanks for the list. I was surprised to see WR’s Kelvin Harmon and Harry N’Keal receive goose eggs on the grading column. The main reason that teams other than the Pats cannot effectively implement in-game changes, and major scheme modifications from game-to-game, is the limitations of the players. The Patriots are the only NFL team with a solid middle-class with only one high-paid player. Every starter is a smart, hard-working, coachable and with high football IQ, perhaps except for a few that they acquire on rental or trial basis. That Pats’ drive that scored the touchdown in the 4th quarter where they switched to 22 personnel for the first time in the season in game situation would not be possible without those mentally sharp players who are on top of their playbooks irrespective how little practice they have had. Pats get it done on D with veterans like Chung and the McCourty twins who may not get a starting role in other teams. Talented players who are “coachability” is questionable (e.g., Chandler Jones) don’g get long term contracts. Take for example, Dee Ford’s offside penalty in the AFC Championship game. Not only would a Pats player never make a bone-headed mistake like that, the other linemen would be policing each other at LoS in such critical situations. The hot takes are all about the meltdown of a coach or the brilliance of another. The role of locker-room culture and players’ mental toughness and alertness don’t get much attention in discussions of long-term success of franchises. Despite the Reuben Foster pick, I’d like to think that the ShanaLynch regime is trying to build that culture by drafting the right players. We’ll see. I get you Mood and agree, but the coach sets the tone very early so that players acquire the team culture. Brown’s interview linked a couple of threads ago I think gives insight to the culture on the Patriots and why certain players weren’t happy (cough, cough Marsh). Grant, given that the Rams offense relies on a limited number of plays, what should they have done to attack the Patriots. Let’s take for granted that the 15 seconds headset turn off and Goff is on his own. How would you attack a defense like the Patriots presented? How would you deal with shifts and things of that nature? I remember hearing that the Patriots didn’t even do a walkthrough and thought “That’s cocky!”, but BB was way ahead of the ballgame. The Rams needed to expand their offense. Four run concepts and two personnel groupings won’t get it done against the Patriots in the Super Bowl. The Rams had two weeks to add things to their offense and failed to do so. The Rams needed to run the ball effectively to win. They should have used more jet sweeps and one-back counter plays. Also, they could have used a fullback or an H-back in the backfield to handle the Patriots’ penetration. Penetration kills a one-back running game because there’s no lead blocker to handle seepage. Thanks, I don’t recall but do they even have a fullback? Didn’t think so. They released one earlier in the year from the practice squad, I think. Would have been impressive to insert him into the game and confound BB. Absolutely. McVay needed some wrinkles, but had none. How much football does he really know? It’s a question that lots of defensive coordinators will try to make him answer in the upcoming year. This is a contentious question but how similar are McVay and Shanahan in game planning and concepts? Do you agree with Houston that injuries may have made Shanahan more flexible? I think he tried new things a couple of times last year, which was refreshing and gave me a bit more faith in him. Extremely similar in that regard. Both struggle with situational football and in-game adjustments. The main difference is McVay prefers 11 personnel while Shanahan prefers 21 personnel. I’m not sure what Houston means by “flexible.” Has Shanahan learned from his mistakes? If so, why is red-zone offense still an issue 11 years into his career as an OC? Is he learning, or does he think he has all the answers? I haven’t seen Shanahan change his play designs in the red zone. Maybe Houston could be more specific. I just skimmed through Grant’s article and the comments but noticed one thing – Grant, did you mean to say that Shanahan needs a Wade Phillips type on OFFENSE? Thought it might be a typo but couldn’t help not asking. Yeah, an elder statesman. Someone with savvy and gray hair. He’s not on the coaching staff. Can’t suggest an in-game adjustment. Why can’t he? He’s got a cell phone. Don’t disagree with your points, except for the rams having a 15 year dominance over the 49ers which is mere opinion. The reality is that the 49ers don’t measure up to the Rams overall talent. That said, it’s going to take more time before Shanahan can be put in the same convo with McVay. I believe that Shanahan could have dominated the 49ers if he were coaching the Rams SB turnkey team. But that’s also mere opinion. Belichick didn’t expose the Rams. Vic Fangio did in week 14. Yup. Belichick exposed it, magnified it and framed it. So true. But that has been Belichick’ MO for the past 18 years with the Patriots. I brought up the subject (Belichick giving a blueprint on beating the rams) right after their Superbowl victory, but it still might not be enough for the 49ers because of the disparity in talent. Yup. I think our beloved team is still several players away from contention and we have 2 teams who should be contenders next year. Unfortunately, I don’t see us among them. I would say for everything to go right we end up 8-8, but more likely 6-10. The Rams 10-6 and go out in first round. Seattle 9-7 and wins wildcard game only to go out following week. Arizona gets 4 wins. Yup, that’s the way I see it as well. With a healthy roster and the addition of key FA and draft picks that can become quick studies, I say we go 8-8. Anything above that would make me ecstatic. Anything below that will cause me disappointment. Bosa, Allen or Q. Williams would make for a good start. Agree on these points except I see 8-8 as under the best of circumstances. Haven’t seen that in this team for many years. Pats spread them out wide? Hmmm, good strategy to counter the stacked box. Pats let the defensive speed over run the play, then ran a counter? Smart. Pats used misdirection to bait the Rams defenders? Effective. Pats put Edelman in motion so Brady could read the defense’s reaction? Where have I heard that before? Pats matched up Edelman on a LB? Classic WCO mismatch. Rams single covered Edelman all game? No wonder he won the MVP. Rams should have done more fly sweeps and RPO’s? No Duh. Rams should have expected the Pats would steal their signals so they knew where the play would go before the snap of the ball? Maybe they should have called a play, then done something totally different..
Rams devolved into running from bunched sets? Played right into the Pats hands. Rams allowed the Pats to shape them? Not a good strategy for success. McVay- ‘I cant wait to see what the Pats are going to do .’ Ummm. maybe that is why he had a bludgeoned look on his face. Mcvay- ‘I am going to call all the plays, so I do not need an OC.’ Belichick had OC Josh McDaniels, who threw out the playbook, and did something totally new, and won a Super Bowl. He made an in game assessment, and made the proper adjustment. McVay- ‘This is going to hurt until the day I die.’ He could have avoided that, with more help and better preparations. Good perspective on all points. I hope KS can learn from this last SB, so he can avoid the pitfalls. I agree, with a healthy roster, I think the Niners can avoid a losing season. With some luck, and if the planets align, the Niners may squeak into a Wild Card berth. The48ers? Win the LA Rams? What a joke! Dream on. Rams are here to stay, and your so called football team are here to stay at the bottom. Go Rams. The San Francisco 49ers have 5 Lombardi trophy’s. LA Rams have none. Saint Louis Rams have one, during their carpetbagger days. Rams fans should not crow, after eating crow last SB. 3 points? Worst performance in a SB, bar none. Joe stomped the Broncos, putting up 55 points. Steve threw 6 TD passes in another Super Bowl. I was hoping that McVay would come out with Gurley in the Slot and have CJ Anderson as the RB all game. Then, do jet-sweeps with Gurley, either giving the ball to him, or faking it and handing the ball to CJ Anderson, or faking that and throwing the ball. Similar to what they did against the Dallas Cowboys in first playoff game…but with Gurley as the Jetsweeper all game long. I was surprised that McVay didn’t really do anything differently or come up with any counter plans to what the Lions and Bears (er…I mean Patriots) would do. I mean, he saw the blueprint from the Lions/Bears as to what teams will do against them. He was poorly prepared. I would expect that he will come up with something to counteract those types of defenses in the coming year though. If he doesn’t, then the Rams tenure at the top will be short lived. Good coaches know how to adapt, as shown by Belichick/McDaniels. It was sad that such a great defensive effort was wasted by the Rams and Wade Phillips. One also has to consider that the Rams were without one of their best weapons in Cooper Kupp and a very low echelon Todd Gurley…He had to have been injured or something to play that little in a close ball game. I fully expect the Seahawks and 49ers to be much more competitive with the Rams in next year’s games and the Division race overall. McVay better hope Gurley’s chronic swelling knee doesn’t put a fork in his career. Good call. I had the same thought about Gurley. The 49ers should use McKinnon as a jet sweeper next season. Rams threw the Super Bowl. Kroenke told McVay to sit Gurley, whether it was because Gurley failed to speak up for him on LeBron’s barber shop show, or there was a higher command. Same goes for McVay’s offense. The guy is way more creative than what he showed. He was basically running a high school offense against the NFL’s equivalent of the Roman army. Thirty other teams could have beaten the Rams. Also, the Patriots managed to not have to play against another top running back, Kareem Hunt. If Hunt was still on the Chiefs, it would have tilted the odds in the Chiefs favor. Something didn’t smell right about that tape and its subsequent release. Why in the middle of the season? How did TMZ get ahold of that tape? Who did they pay? Who set up the payment? Why? Who did it ultimately benefit? NFL sent out it’s wrecking crew of refs two weeks before in the championship games. The game itself had as much fizz as flat seltzer. Even the two weeks leading up to the dismal clash, were boring, non-descript and endlessly driven corporate marketing opps. Gone are the days when the lead up at times was as interesting as the game itself. Who remembers Bill Walsh greeting the team bus in Detroit as a bellman? The Raiders storming the Big Easy? Namath’s cocky prediction? They’ve removed the personality from the game. Bland as Tom Brady’s avocado ice cream, and nearly as predictable of Bellechik’s pressers. Slam, are you impugning the integrity of the game? So am I. The fix was on, once Kraft praised Trump publicly. The whole system is rigged, because they will not reform the officiating. Games are easily decided by missed calls and non calls. I will disagree that the Rams threw the game. Belichick bludgeoned McVay. He did not know what hit him, and did not have a clue how to respond. I think Gurley was not at 100 %, but they were thoroughly out coached. McVay admitted that, because it was so obvious. Who could have obtained that tape? The National Enquirer. Why do you think Kraft, praised Trump? Read the Art of War and read about the methodology concerning how surreptitious means can defeat a foe without striking a blow. Who did it ultimately benefit? The Super Bowl Champions. They both should not have even been in the SB. It really should have been the Chiefs- Saints Super Bowl. Putrid biased officiating decided the outcomes of the game. 3 straight challenges, and the Chiefs lose every one of them? Convenient. Usually the ref will tell a player if he is off sides before the snap. Too bad he forgot, and negated an interception. There should have been PI and helmet to helmet, but not only the line judge, but every official on the field, swallowed his whistle. An official in the booth would fix the problem, but some lame excuse prevails. I agree, it was a real snoozer. Even the commercials fell flat. It was like they were trying too hard. Some were tone deaf. Poor robots. Serial killer comedy? Corn syrup? How could one tell, the lite beers are so watered down. I did not even watch the halftime show, but heard the pop and rap was incongruous. Oh how I miss performances like Prince in the pouring rain. Yes, Belichick and Brady have now won 6 rings, but like Tuck Rule, Spy Gate, Deflate Gate, and the miraculous come back against Atlanta. these wins will be with an asterisk. Against Atlanta, Trump was not happy. He left the room and guess what? in the second half, all the calls went against the Falcons, and the Pats O line held, but was never called for it. In this last game, as in the Chargers and Chiefs game, it sure looked like the Pats knew what play was going to be run before the snap of the ball. It sure helped their defense anticipate. I have a novel idea. Why don’t we reform the officiating, so the games are decided fairly? Maybe have the goal to be- get the right call. Let the game be determined by the players, not the officials. Some may think this is Pollyannish, but they should strive to restore the integrity of the game. Oh no, 479 words… Keep trying Sebbie, you can do better. Your overall blog comment rating is dropping under 80.5. Keep this up and your rookie card will be worth less than 50 cents. Two years ago it was at $14.75 on ebay. So sad. I’ll ask you, so you can tell me………..what kind of a mind interjects his politics into everything that upsets him? Isn’t that a knee-jerk reactionary type of mind? Always upset about something? I know you worship Trump, so I am just needlin’ ya. No, Saw, you are the ‘knee jerk reactionary’, I am the ‘bleedin’ heart liberal’. What, me upset? Moi? Did you know that soon we will see how many millions Trump is benefiting from his tax bill, while middle America has large increases. He promised that he would be paying a lot more, while the middle class would get reduced taxes. A con. Just like he said that Mexico would pay for the wall, and soybean farmers are losing their farms due to the tariffs, but still support Trump. You are being conned, and taken for a stooge. You are supporting a con man, against your own self interests. Trump got Kraft to praise him, because he found dirt on KC’s Hunt. That is his modus operandi, just like accepting foreign interference, while denying it. Trump, by calling Kaep an SOB, was the one injecting football into politics. This blackballing is Trump led. Heck, he fixed an election, fixing the SB is small potatoes, and so easy to do. No facts, just opinions. Prove he fixed anything, Mueller can’t, now 2 yrs. Pelosi and Schumer and I believe Osama wanted to spend billions on a wall 7 years ago, now nothing. The problem with socialism is eventually you run out of other peoples money.